Wireless temperature monitoring is becoming an increasingly attractive option for hospitals across the United States—and for the clinical labs within the larger institutions. 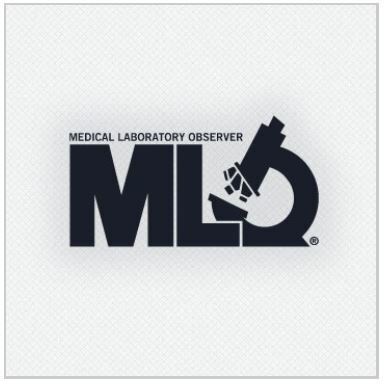 The benefit for clinical laboratorians can be significant: wireless monitoring takes less time than manual logging; it is more efficient; and it provides more accurate and reliable temperature readings, as required for audit compliance. In addition, wireless solutions are easier to install and maintain than wired systems. As wireless systems gain acceptance, it’s important to understand that wireless is not a single protocol. The wireless spectrum contains many separate radio frequencies capable of transmitting temperature readings from a refrigerator, freezer, or laboratory into a central software application. Two commonly used protocols are WiFi, which operates at 2.4 GHz, and 900 MHz. Commonly referred to as 900MHz, the full band includes frequencies from 902 MHz to 928 MHz. WiFi is typically the first option that comes to mind for wireless temperature monitoring. It’s ubiquitous and should be able to leverage any investment a hospital has made in existing infrastructure. Plus, a hospital’s facilities or IT department may be reluctant to add another network to manage, as may be required for a 900 MHz solution. On the surface, WiFi may seem to offer a ready path to automated temperature monitoring. But before declaring the issue closed, let’s consider how 900 MHz compares. WiFi and 900 MHz operate within what the FCC defines as unlicensed spectrum, or frequency bands. Each protocol must comply with different standards, directly related to their respective operating frequencies. The standard defined for WiFi’s 2.4 GHz frequency makes it ideal for transmitting large amounts of data, operating at a rate of 150 megabits per second (Mbps), across a network. Typical applications optimized for WiFi’s high data rate are staff access to patient records, medical imaging, or patients and visitors streaming multi-media. But this larger payload comes at a price, requiring more energy to transmit the payload with a relatively short range. To illustrate the point, consider how much harder it is to carry 100 pounds vs. one pound from one place to another. Carrying 100 pounds requires more energy. Conversely, lower frequencies send smaller amounts of data, with 900 MHz operating at a rate of 25 kilobits per second (Kbps). With its smaller payload, 900 MHz consumes less energy than WiFi, and can transmit a message over a longer range. Typical applications optimized for 900 MHz’s data rate are machine-to-machine communications, where one piece of hardware reports into a centralized application. It is natural to assume that more data capacity is good and less data capacity is bad. But temperature monitoring requires only a small payload to transmit a temperature reading, having no need for WiFi’s large payload capacity. A 900 MHz system more optimally matches the payload requirements for temperature monitoring to available data capacity. This has implications, noted below, for clinical laboratorians concerned with the accuracy and completeness of their temperature monitoring logs. As noted above, WiFi has to work much harder than 900 MHz to transmit a temperature reading across a hospital campus. As a result, battery life for a WiFi transmitter is typically measured in months, where battery life for a 900 MHz transmitter is measured in years. A 900 MHz system can require less frequent battery replacement when compared to a WiFi system, resulting in less interruption to the data logging process. Less frequent battery replacement equates to less time and cost needed to maintain the system. Collectively, a 900 MHz system provides a productive gain over WiFi in this category. In addition to battery life, there are differences in network configuration. A typical WiFi transmitter can cover 7,500 square feet indoors. WiFi access points, strategically located throughout the hospital, receive signals from WiFi transmitters associated with each specific access point, delivering the temperature readings into the monitoring application. 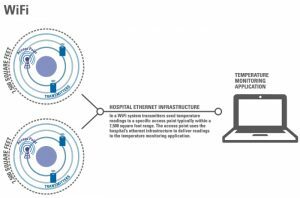 In some instances, a hospital may have to add access points to adequately cover all the transmitters the temperature monitoring system requires. A 100,000-square foot hospital might need 13 to 15 access points to provide adequate coverage (Figure 1). A typical 900 MHz transmitter can cover 25,000 square feet indoors. A repeater, which has a typical range of 50,000 square feet, can pick up and retransmit a signal from any transmitter within range. This offers multiple redundant paths for a message from any given transmitter into the monitoring application, effectively increasing the reliability of message delivery. A 100,000 square-foot hospital might need just a couple of repeaters to provide adequate coverage (Figure 2). With 900 MHz, clinical laboratorians benefit from complete and accurate temperature logs, while the hospital more broadly gains a solution that minimizes network complexity and system upkeep. A WiFi network is a shared resource, supporting multiple applications across the hospital, with the top priority being throughput for data-dependent tasks such as staff access to patient records and medical imaging. The ability to accurately log temperature data may be impacted by something as benign as routine system maintenance. For example, it may appear that the temperature monitoring system is down, resulting in a laboratorian incorrectly reporting a problem where none exists and the need to employ back-up procedures for log continuity. In reality, the WiFi network was simply unavailable during a system upgrade. Conversely, a 900 MHz network solution is dedicated to supporting temperature logging. It is generally deployed by a temperature monitoring vendor as part of a complete system and not the on-site or contracted IT department. Troubleshooting is contained to the single 900 MHz system without the complexities entailed in troubleshooting a shared resource or multiple sources of WiFi hardware. For the clinical laboratorian, whose job depends on the accuracy of data, temperature monitoring is a necessity. Wireless temperature monitoring has proven its value overall. However, specific to a hospital campus, 900 MHz offers the advantages of minimal supervision, with longer battery life and greater range than its WiFi counterpart. For laboratorians requiring accurate and complete temperature logs, 900 MHz may be the preferred alternative.